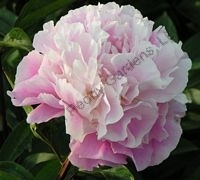 Blush, double, very fragrant, midseason, 36" tall, lactiflora. The pale mauve-pink flowers lighten in the center. A much loved heirloom variety with a loose, romantic form.